I was intrigued by the write up of this recipe, from Southern Living. Celebrating with pancakes instead of champagne?? Outrageous! I’ll let you check it out for yourself, because I didn’t make any changes to the recipe at all. I only made a half batch, using 1 Tbsp white vinegar per 1 cup minus 1 Tbsp of whole milk as a substitute for buttermilk (Mix and let it sit while you get the rest of the stuff ready). For some reason, I never get as many pancakes as advertised, out of whatever recipe I make. So, I didn’t get 10 instead of 20 — and I really really wished that we had at least 4 more to eat for our breakfast! So, don’t be stingy — if I’d had any leftover batter, I would have cooked them all up and re-heated, another day soon, in the toaster oven. You’ve been warned. The ingredients all look “normal,” but the results are pretty much divine. Looking forward to making them again soon. I made these at Lawrence’s cousin’s in November 2015, and then again on Valentine’s Day 2017, this time adding a big handful of blueberries. I decreased the sugar to about 3/4 c. I used almond milk instead of cow’s milk, with the vinegar mixed in and it worked fine. They really ARE good pancakes. We had a few during the next day or two, heated up in the toaster oven, and they were delicious and practically instant. A couple of scoops of full-fat Greek yogurt, half a cup or so? 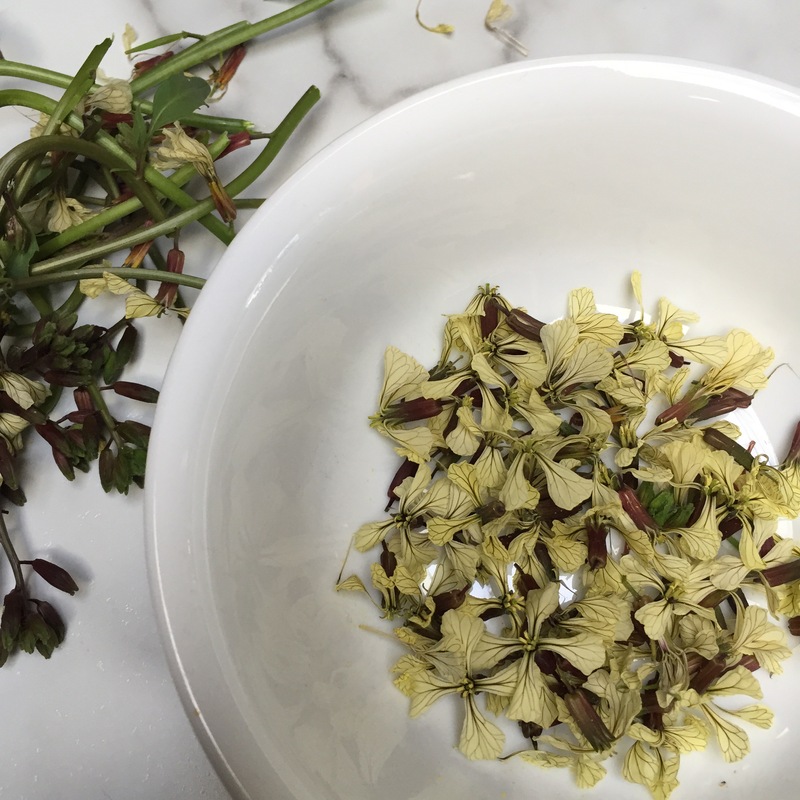 Something like 2 tbsp mint, I used mostly mint flowers this morning. Two hands full of ice cubes. The mint was purchased on Friday from the beautiful BUGS garden. BUGS (Boise Urban Garden School) provides school and youth groups with learning experiences in their garden, kitchen, farm stand, and classroom. It’s their first growing season in their new location which is just gorgeous. 1 1/4 cups flour (I used a mix of whole wheat and organic white), spooned and leveled. Take about 1/8 cup of flour out of the dry ingredients before stirring together. Then stir together the dry ingredients. 7 tablespoons butter, melted, plus 1 tablespoon for the skillet. Yes, this is a whole stick! Mix the wet ingredients together in a smaller bowl. 2 containers fresh blackberries (5.6 oz each) — instead, I used a mix of blackberries, raspberries and blueberries, a total of 13 oz. I’m using my kitchen scale more often these days! I wanted to know if it turned out to be too many berries–it’s not. There’s enough batter to go around. Sprinkle the reserved flour on the berries and toss them gently so they are all covered. It’s not a deep cake but flouring the berries helps keep them from sinking during baking. • Preheat oven to 375. Mix the dry ingredients in the larger bowl, then the wet ingredients in another. Pour into dry ingredients and combine gently. Martha suggests a whisk. Don’t overmix. 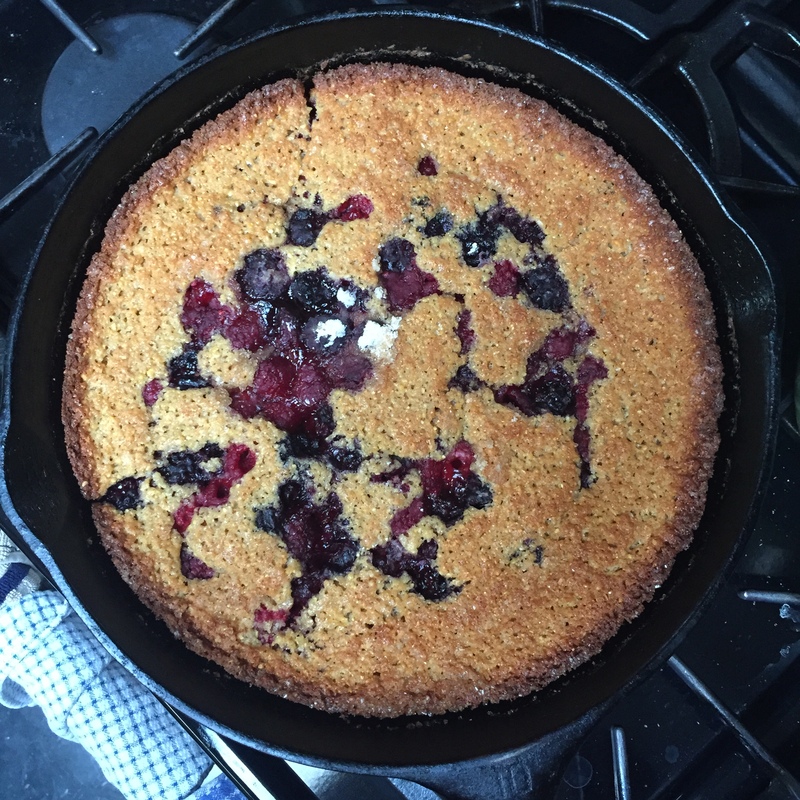 • Put remaining 1 tablespoon of butter into a 10-inch skillet (preferably cast-iron; I used my mom’s old 12″ cast-iron pan–which makes for a flatter cake), and put into the preheated oven until the butter is melted and the skillet is hot, about 5 minutes. Remove from oven and swirl to spread over the bottom of the pan. • Pour batter into skillet, put berries on top and sprinkle with the additional 1/8 cup of sugar. I used demerara but regular sugar is fine. • Bake for 45 to 50 minutes, with a baking sheet on rack below to catch any drips (could be important if you are using a 10-inch pan). Let cool slightly, about 30 minutes. Run a knife around the edge to loosen; cut into 8 pieces. Serve warm or at room temp. It’s Lassi Time — Summer’s Arrived! Summer’s here right on schedule, in time for Memorial Day Weekend. 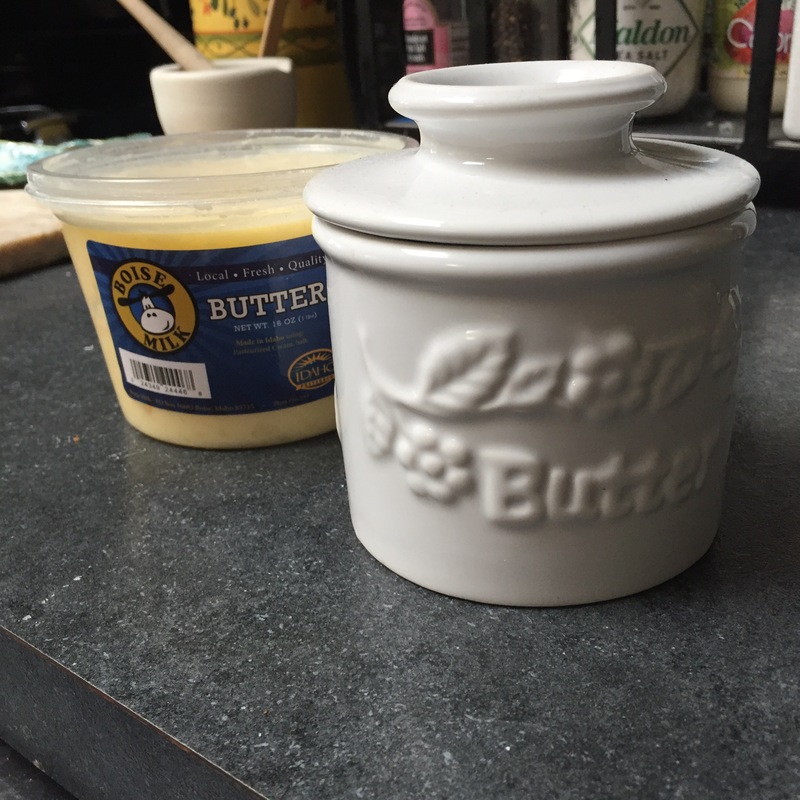 It’s time to load up the butter bell. I also dug out some seltzer water and club soda to keep cold in the fridge. Thundershowers have been building up in the afternoons for several days; all’s right with the world. We had our first lassis of the season for a weekend breakfast: mango-cucumber-mint-ginger (I think that’s all), with whole milk, full fat yogurt, ground ancho chili pepper and a little local honey. 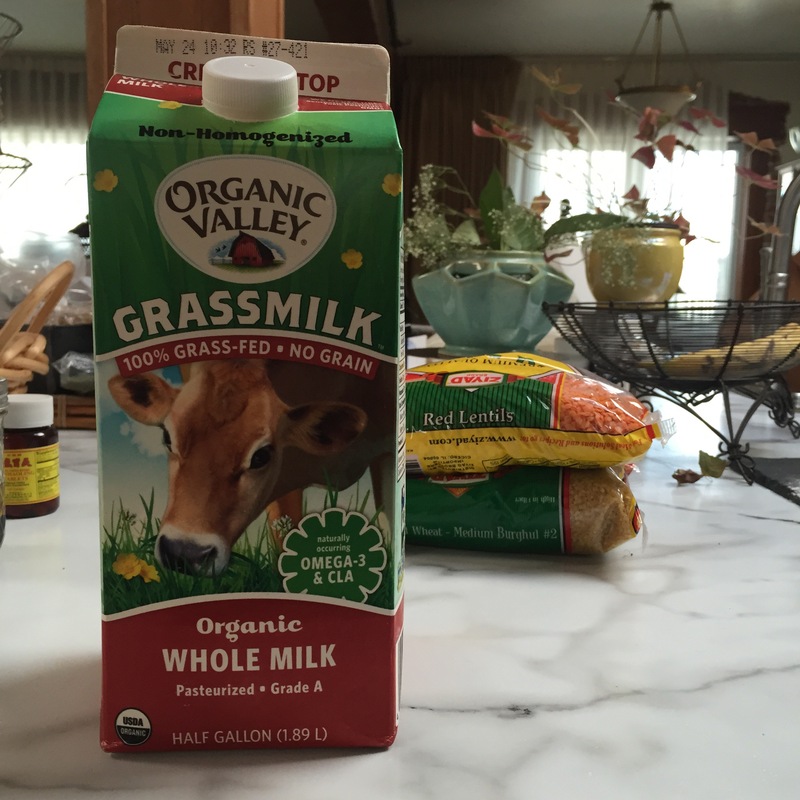 I’m loving this new-to-my-supermarket milk: Organic Valley Grassmilk–mmmmm, good! There’s a whole lump of cream in there that I can feel when I shake it. 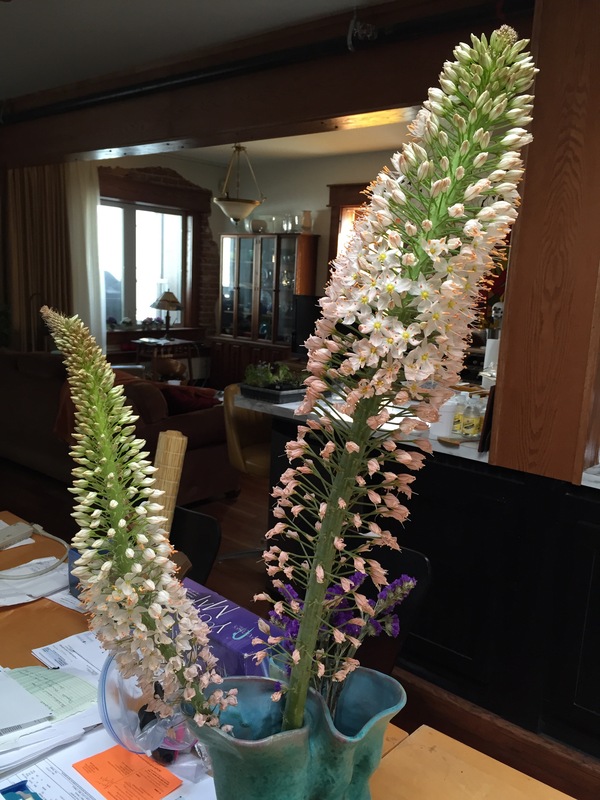 Ok, the last thing to show you are these gorgeous foxtail lilies that I’ve been buying at the farmers’ market around the corner from us. They are so cool! They last about a week. 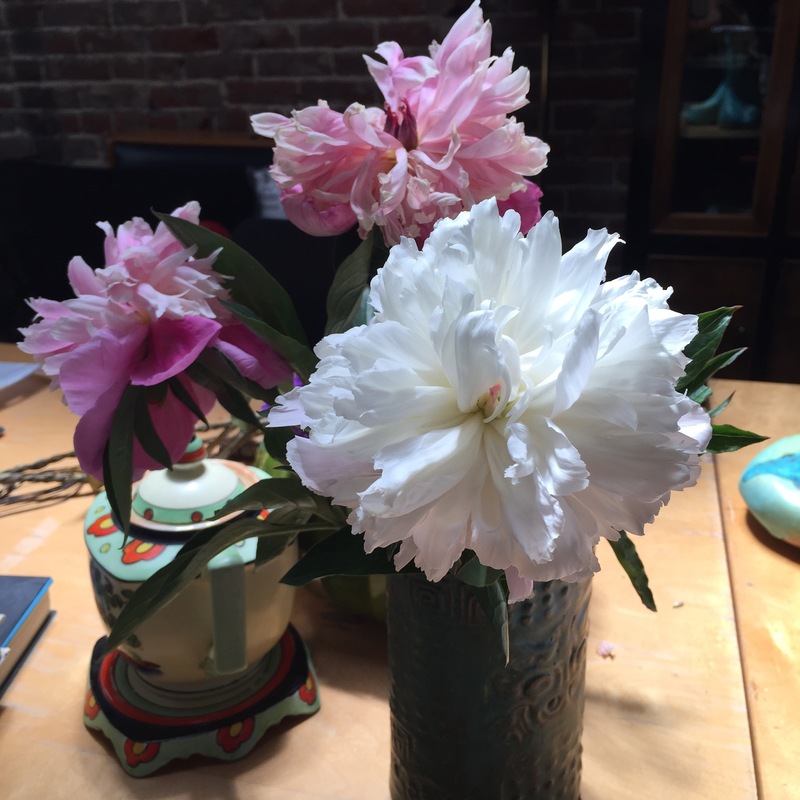 I was late to market on Saturday and they were already sold out, so I picked up these peonies instead, right at the end of their season. 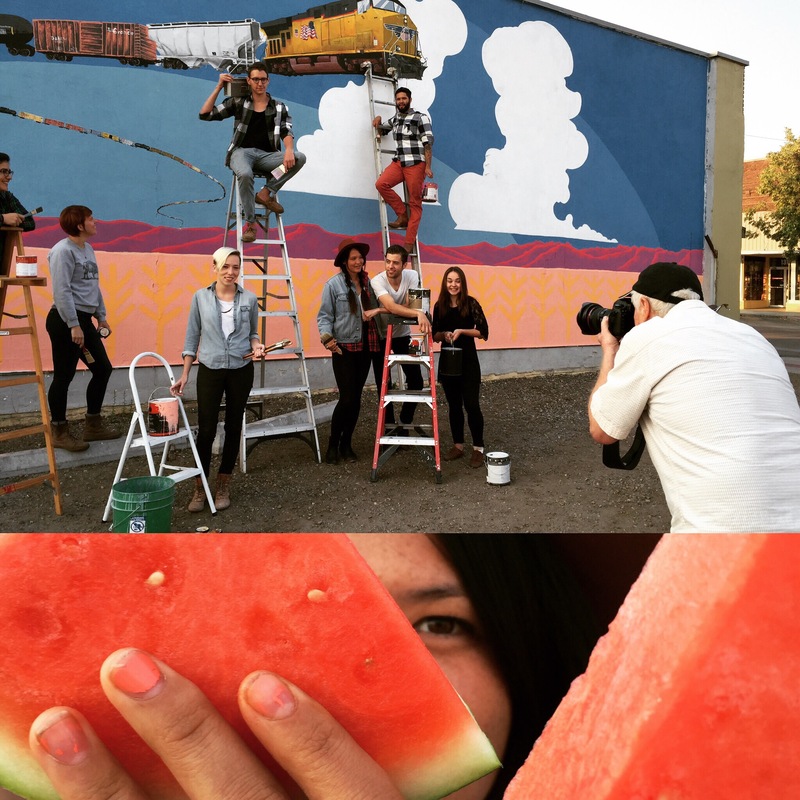 I’ve never grown them–too hot in L.A. and no dirt here in Idaho–a friend here had to tell me they smell good. And they do! I love social media! 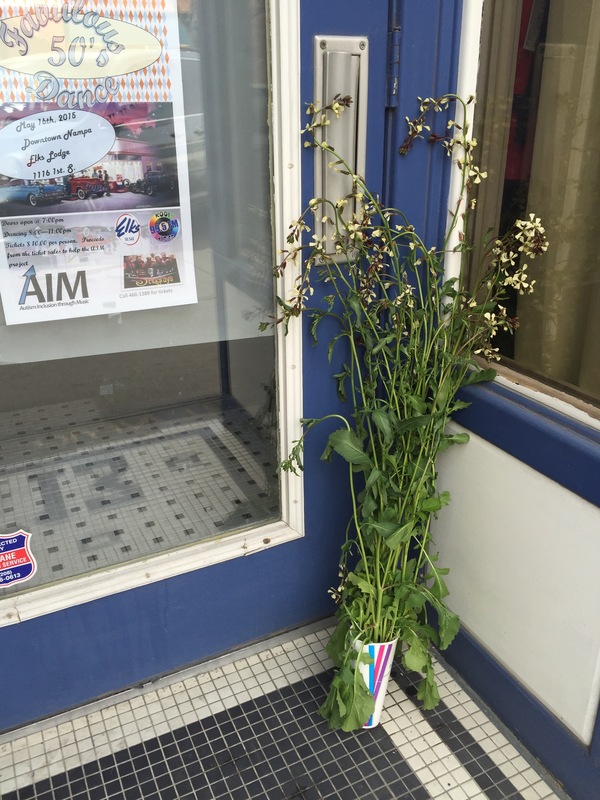 Friends in the next town posted a message, with photo of a huge patch of arugula in full bloom, saying their arugula was out of control and that anyone and everyone who wanted some should come over right away. We had to put this special treat and unexpected gift to good use right away. Aren’t the flowers pretty? Wait til you taste them! Peppery but more delicate than arugula leaves. Sometimes you hit a sweet one, too. Mmm! I bought a mango earlier in the week, to try this trick which worked like a charm, exactly as advertised. When you try it, watch that you don’t tear the skin as you get started, and don’t leave too much of the mango flesh attached to the peeling. Much too tasty to waste! 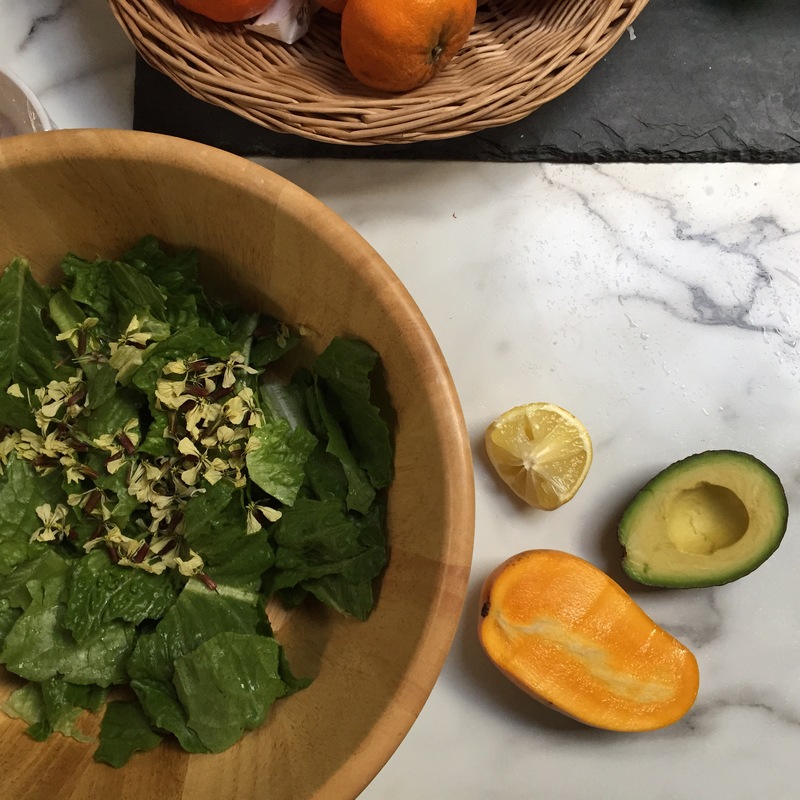 Place dry lettuce and arugula leaves in salad bowl. Add salt now and toss to mix through. Add everything else except lemon zest and almonds. Save them for later. Add olive oil sparingly and toss gently. Taste to see if you’ve got enough. Honey — I dipped a plastic chopstick into the honey jar and drizzled most of what stuck to it over the top of the salad. Don’t overdo it! Lemon zest and slivered almonds. Toss gently but well and serve. I was happy to find this recipe is a keeper. Slightly adapted from FOOD52’s post of Deborah Madison’s Potato and Green Chile Stew. Other than the poblano, chances are good that you already have everything you need to make this quick delicious dinner. Big L had seconds, I only had one serving, and there is about 1 cup left for next time. I think we could have finished it off! Easy to double or triple, I’d think. Tasty as can be. Cheap to make. What more could you ask for? ADDITIONS: whatever you’ve got that sounds good. I added 1 small zucchini, chopped, a few tomatillos, a few green cherry tomatoes, a few orange cherry tomatoes — whatever is hanging around : ) I may try some chopped greens, which are good to add to anything, right? Chop the chiles, coarsely. Heat the oil in a larger cooking pot. Cook onions, any additional veggies. Add cumin and coriander and let it sizzle. Cook a while, then add garlic, potatoes and cook some more,add 1/2 tsp salt. Then add liquid (stock or water or combo), and the chopped chile, bring to a boil, then let simmer, covered, for 20-30 min. Don’t let the potatoes get too soggy. Mash some of them to thicken the broth. Garnish as desired (I forgot to, and it was fine). Forgetting is a common occurrence whilst cooking! I’m really enjoying my first CSA subscription ever, from Wissell Farms in Nampa. 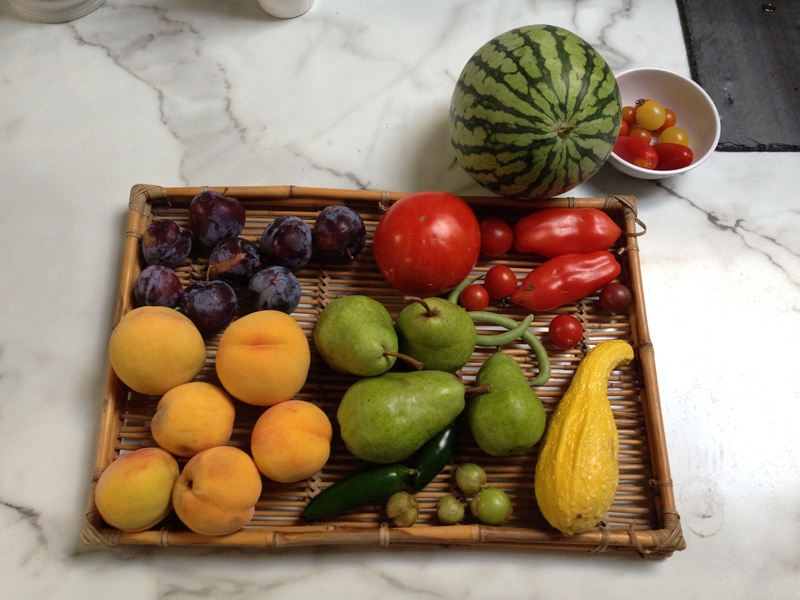 Here’s what came this week: Plums, pears, peaches, peppers (not shown: 3 big green peppers, 3 red potatoes and more jalapenos and 6 ears of sweet corn); the personal size watermelon–so cute!, a huge cantaloupe, which already went in the refrigerator. 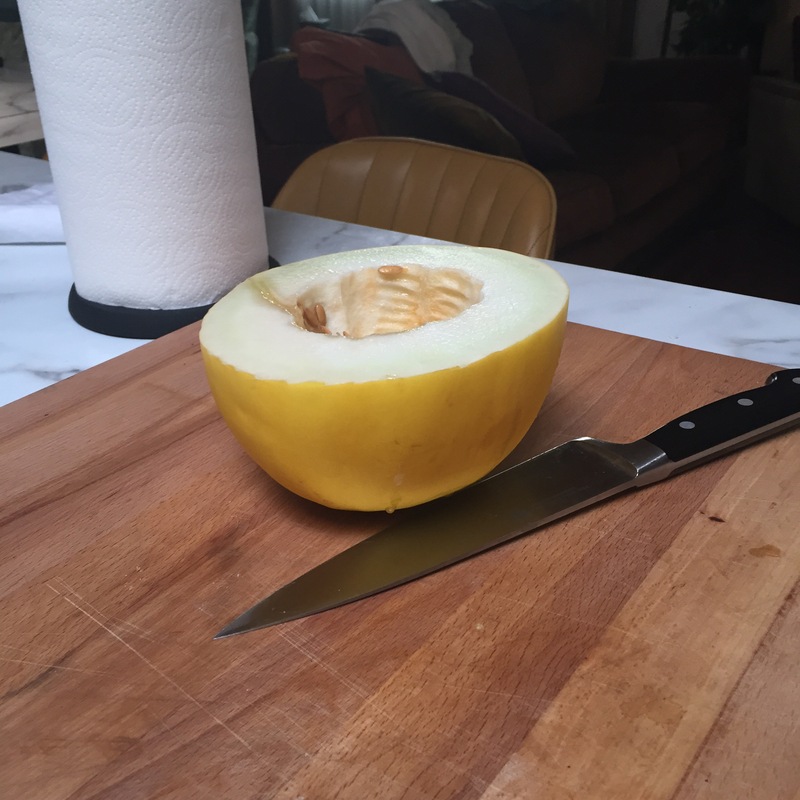 The melons have been really sweet, and we love them nice and cold right out of the fridge. Shown in the photo, but actually from the neighborhood co-op garden over on 15th Avenue (we live on 12th Avenue): the tomatoes, green beans and summer squash. In related—and very exciting—news: We rather suddenly have an additional refrigerator in the kitchen! This is a 4.4 cubic foot beauty from Costco. It was installed as a built-in underneath the kitchen island, next to the old fire hydrant (yes, you read that right) which was previously responsible for holding up the countertop (lest dancing break out on the island some fine evening). The new refrigerator holds all our greens and veggies, and some condiments will probably making their way into the door shelves, coming over from the big fridge little by little. This frees up LOTS of space in the main refrigerator, so that it can be better organized. I hope to do a better job of getting our leftovers eaten because I’ll be able to find them more easily.